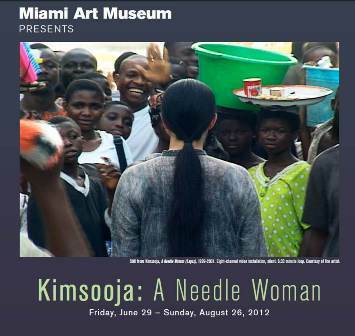 On June 28, Miami Art Museum opens Kimsooja: A Needle Woman – a multi-channel video installation by Korean artist Kimsooja. The exhibition provides an epic sense of globalization’s impact on cities throughout the world. The eight synchronized large-scale videos, each depict a major metropolitan center: Cairo, Delhi, Lagos, London, Mexico City, New York, Shanghai and Tokyo. In each projection, a lone figure wearing neutral gray clothes – the artist – stands motionless with her back to the camera, braced against a torrent of pedestrians. The presentation also includes two closely related works by Kimsooja: In A Needle Woman – Kitakyushu, the artist lies prostrate atop a rocky peak as clouds swirl hypnotically above her, while in A Laundry Woman – Yamuna River, she stands at the banks of a sacred waterway in India. Together they create a space of timeless serenity within the installation.